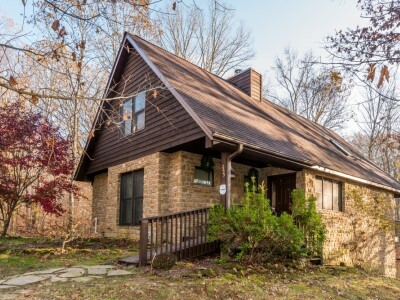 This family vacation cabin was built with native Brown County stone and cedar and is in the "heart of the south", southern Brown County Indiana, close to Story. This Brown County cabin, is nestled into 16 wooded acres near Nashville, Indiana. Listen to the night sounds of tree frogs and hoot owls while enjoying the most stars you have ever seen from the main deck, the fire ring or while relaxing in the steaming hot tub. During the morning and early evening hours there are plenty of deer, turkey, squirrels and songbirds to enjoy. Walk the trails, with bridges over Blue Creek, on this wooded property or enjoy the hiking, bike and horse trails in Brown County State Park. Don't forget your camera, walking stick and binoculars to view the best of Brown County's natural scenery. This romantic getaway retreat is a 3 story cabin equipped with all the amenities of home. The main level of this vacation cabin includes a livingroom with skylights in the cathedral ceiling and a gas log fireplace, a king bedroom with a full bath, a fully equipped kitchen with dishwasher and microwave, dining room and there are decks (one covered) overlooking the surrounding woods. The livingroom has TV/Blueray/SAT with movies (you may want to bring some favorites). Upstairs, the loft has a king bedroom, half bath and a library with another gas log fireplace and TV. The lower level of this cabins is a family room with pool table, game table, dry bar & fridge, TV/SAT/Blueray and a full bath. This level has a covered patio with an outdoor hot tub. Foxfire is just a 3 mile drive, hike or bike trip to the historic Story Inn. This beautiful rustic home adjoins Lake Monroe Forest and is less than 1/4 mile from Hoosier National Forest. This cabin is 3 miles to State Road 135. Downtown Nashville, Indiana, with over 250 unique shops offering local crafts, antiques, jewelery and art is a short drive. Little Nashville has Plenty of dining and live entertainment. From 135 take St. Rd. 46 to Columbus (east) or (west) Bloomington.